July 15, 2001 As if Mother Nature were in cahoots with the Cherokee project, the usual sweltering July temperatures haven’t seemed to show up in full force. This week, as heavy fiberglassing gets underway on the transom and sides of the hull, cool Autumn-like weather has moved in – perfect! 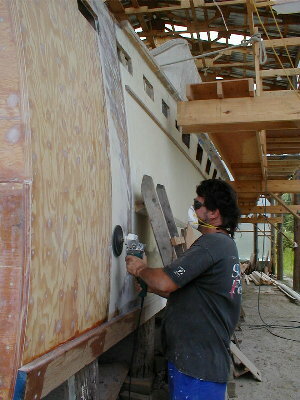 Below, Bud is preparing the hull sides to receive fiberglass sheathing. The sheathing is glued in place. 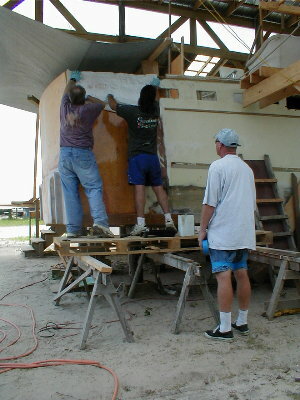 Once dried, it will be sanded and fared in to the rest of the hull. 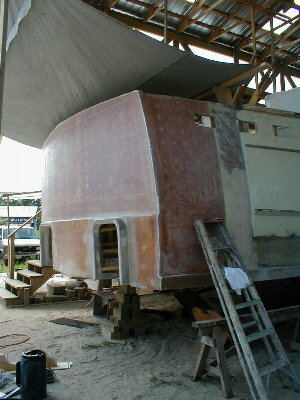 The fiberglassing of the transom, we are glad to report, is completed. 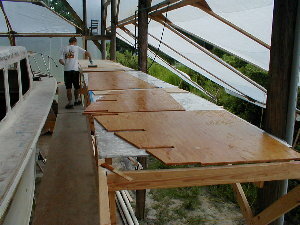 This fiberglass provides the substrate for the varnished mahogony transom that will be installed at a later date. Everyone is feeling the fiberglass itch! 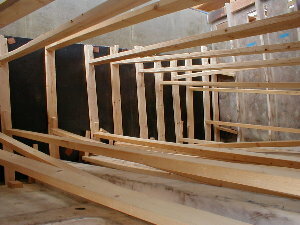 The decking in the forward guestroom is getting a coat of epoxy. 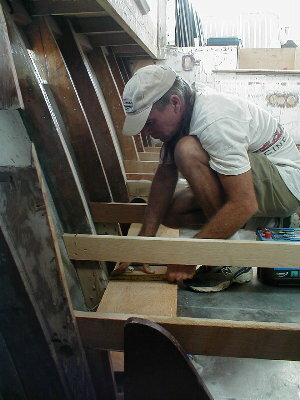 Meanwhile, Jim is fitting deck beams and decking in the galley area. 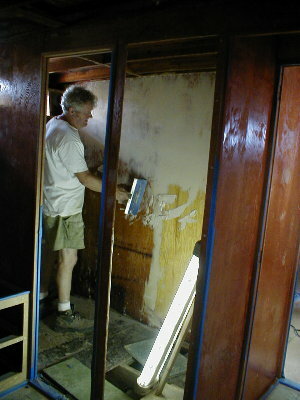 Norm is applying faring compound to the aft guestroom head. 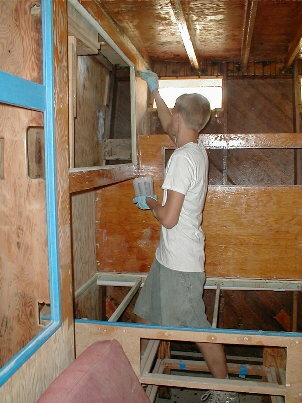 His sidekick Brooks is coating panels in the aft guestroom itself. 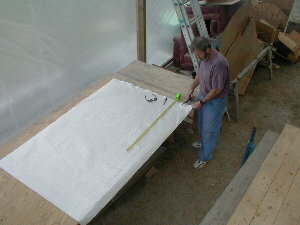 This faring process takes many hours of sanding to provide a good, flat, fare surface for paint. The black, lead-impregnated rubber mat has been glued to the engine room bulkhead. Lead is used for sound-deadening because of its density. It also keeps the bulkhead from vibrating at a high rate of speed. The mat is being held in place by many stifflegs as the glue dries.